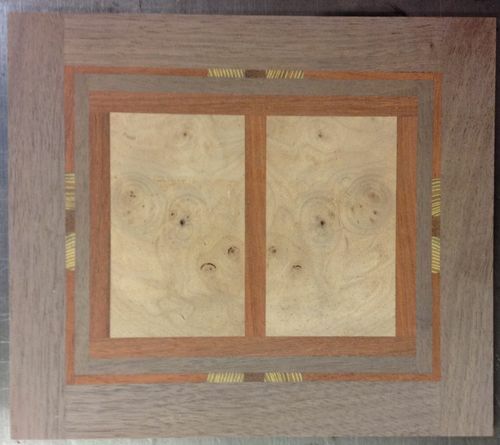 The excellent projects posted recently by A&C Style (headboard), Edward (G&G mirror) MBS (Walnut curio cabinet) have inspired me to sit down and take the time to do a proper write-up for the FLW inspired mosaic panel I recently finished. As part of the design process for the Taliesin desk I built last fall, I spent a lot of time making panels similar to the stained glass panels in the ceiling of the FLW Oak Park studio. Basically, I was getting into the mood to build the desk and I used the panels as a way to get my mind properly in tune with the project. The panels are made from lots of little pieces of red heart, cherry, bubinga, yellow heart, bloodwood, purple heart, walnut, maple, and probably a couple other species I forgot. Each panel is 3/8” thick, 12” tall x 9” wide. I glued up sections and then glued the sections together to form the pattern. Rather than using dye, I chose to go with natural wood colors which resulted in a red theme rather than a green one like the stained glass. I finished the panels with Arm-R-Seal and sanded them to 4000 grit before the final coat. Things got in the way, there were other more pressing projects to finish, including the desk. Finally, last week I decided to hang the mosaic panels in a cherry frame with ebonized walnut accents. Ebonizing walnut meant that I had to make iron sulfate. Actually, it is quite easy, pour a bottle of ammonia from the local big box store into a bucket, throw in some steel wool, cover and let sit for a couple of weeks. Stir the steel wool around every couple days. After a couple of weeks, discard the steel wool, strain the liquid into a bottle and you have some excellent iron sulfate for ebonizing wood. There are plenty of articles on ebonizing wood. In a nutshell, the iron sulfate reacts with the tannins in the wood causing the wood to turn black. You can achieve extremely black ebonization by making up some tea (think Lipton’s) and wiping it on the wood to increase the amount of tannins in the wood. For min application, the walnut turned a glorious shade of black almost immediately. One word of warning, don’t get this stuff around anything you don’t want to stain black. It is potent stuff. If it drips on wood it will turn it black. I wore gloves and an old shirt so I wouldn’t get any on my skin. I still managed a few black stains on my wrist. After the walnut parts dried, I lightly sanded it with 800 grit paper to knock down the nubs. From there, I glued up the frame and finished it with Arm-R-Seal, sanding between coats with 800 grit then 2000 grit before the final coat. The final dimensions are 20” tall x 36” long. I bought a heavy duty hanger from the big box store and hung it next to my Taliesin desk. Does this mean I can check the end grain cutting board off my bucket list? I’d like to think it qualifies. So incredible and demanding work! I like that frame too. Beautiful work! I like your non-standart decision. I woke this morning and the first thing that popped into my head was the fact I had the wrong recipe for ebonizing the wood. The solution is made with vinegar (acetic acid) and steel wool to make iron acetate, not iron sulfate. Sometimes you just get it all wrong. Apologies. Here is a link to an article about ebonizing. Earl, this is a very nice piece. I love the frame and the various contrasting colors in the patterns. I may have to make one of these. I like this – very well done. Earl, thank you for the compliment, but this piece you made is awesome. I love FLW tiles, but don’t like their prices so your idea might get “borrowed” in the near future. Thank you for sharing! I really like this piece and wish I had seen it before making my bed. I may have to make another bed with a headboard and footboard in a stained glass theme. Since it has a repeating pattern, I wonder if it could have been made as a thick block then resawn into three individual pieces. What do you think? mbs – I thought about making a block and re-sawing it after I finished the second panel. The band saw height will be the limiting factor on how tall the block can be. Still, making a couple of blocks, re-sawing them, then gluing them together would be much faster and more consistent than my approach. I sort of stumbled into building the panels and it just sort of evolved. No wonder it was one of the Daily Top Three. I’ve been making box lids with the same idea. (This lid is still raw wood.) This one has maple burl panels surrounded by padauk. The thin strip all around is padauk interrupted by end grain Osage orange. The padauk between the two Osage orange “beads” is end grain padauk, which accounts for the darker color. The rest is black walnut. Don’t mean to co-opt your post. Your FLW panels are very inspiring and I appreciate your sharing them. Well done. You’re more than a woodworker. You’re an artist! This is my first visit to your projects. Wow! Outstanding pleasing work.